The Texas legislature once again is debating a bill that would criminalize texting and driving statewide. And recent crash data from the Texas Department of Transportation reveals that the problem of distracted driving is only getting worse. It’s finally time for Texas to get tough on texting behind the wheel. In January, lawmakers from across the state convened in Austin for the 85th regular session of the Texas legislature. For the fifth time in recent years, state representatives will attempt to pass a bill outlawing the dangerous — and far too often, deadly — act of texting from behind the wheel. More than 90 cities in Texas prohibit or limit the use of cellphones while driving, but previous legislative efforts to ban texting and driving at the state level have either failed to garner sufficient support to make it to the governor’s desk or were vetoed upon arrival. This has led to a patchwork of inconsistent, city-specific provisions, an inability to enforce these laws by state law enforcement officers, and missed opportunities for increased public awareness about the dangers of texting and driving. Our research team recently performed an exhaustive analysis of hundreds of thousands of units of Texas crash data spanning the past seven years (2010 through 2016). Our findings conclude that the problem of cell phone related accidents in Texas has risen sharply since 2014. Specifically, the data shows that the northern portion of Harris county has seen an enormous increase in cell phone related crashes over the past two years, which we explore further below. The crash data was provided by the Texas Department of Transportation. It includes all vehicle crashes that were reported with cell phone use as a contributing factor that occurred in Texas between January 1, 2010 and December 31, 2016. To download raw crash data click here. Note: The crash data includes only crashes where cell phone use specifically was cited as a factor. It does not show crashes were other forms of distraction were reported as a factor. 62 vehicle crashes caused by cell phone use in Texas in 2016 resulted in fatalities. From 2014 to 2016, fatal vehicle crashes caused by cell phone use increased by over 52% compared to fatal crashes from 2010 to 2012. 205 vehicle crashes caused by cell phone use in Texas in 2016 resulted in incapacitating injuries. That represents an increase of over 70% between 2012 and 2016. Over 70% of all cell phone related crashes in 2016 took place in 10 counties. Nearly 40% of all 2016 cell phone related crashes in Texas occurred in Harris County. This total is disproportionately high, as Harris County constitutes just 16.5% of the state’s total population. 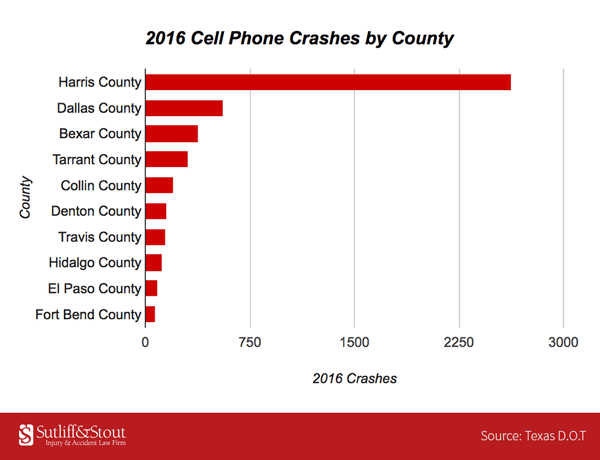 The question of what has caused this drastic increase in cell phone related crashes in rural northern Harris County is ripe for further investigation. Texas is one of just a few remaining states without a statewide ban on texting and driving. 46 states ban text messaging for all drivers, as does the District of Columbia, Puerto Rico, Guam, and the U.S. Virgin Islands. The effectiveness of state bans on dangerous driving behavior in decreasing injuries and fatalities in roadway accidents has been demonstrated in a number of large-scale scientific studies. The success of many of these critical public safety laws was bolstered by impactful public awareness campaigns. It’s finally time for Texas to join the majority of states in the country and take decisive statewide action to curb the life-threatening practice of texting and driving. With distracted driving causing hundreds of fatalities and thousands of injury-causing accidents in Texas each year, and traffic deaths at an all-time high, we can no longer afford to wait for a statewide texting ban to take effect. When it comes to traffic safety laws, statutes with well-publicized enforcement by police officers and sheriff’s deputies are a powerful countermeasure for dangerous driver behavior. Take, for example, mandatory seatbelt laws. Prior to the passage of the first state mandatory seatbelt law by New York in 1984, various surveys recorded seatbelt use of merely 10 percent of drivers and passengers. Statistically significant studies showed that in the states that followed New York’s lead, seatbelt usage increased quickly to approximately 50 percent shortly after a seatbelt law took effect. Within 12 years, all but one state had enacted a mandatory seatbelt law in some form and a powerful nationwide public awareness campaign about the consequences of seatbelt nonuse had been initiated by the National Highway Traffic Safety Administration (“NHTSA”). The message of the “Click It Or Ticket” campaign was clear: get caught driving without a seatbelt and you’ll pay a hefty fine. Since 2004, all states have participated in the “Click It Or Ticket” campaign and more than $8 million in state and national advertisements are run each year. Now, seatbelt usage has risen to nearly 90 percent in states with strong seatbelt laws and the Center for Disease Control credits seatbelts with saving more than 12,000 lives annually. Strict drunk driving laws, which are now on the books in all 50 states, have been similarly effective in reducing serious and fatal motor vehicle accidents. Since the 1980s, when DUI laws lowering the legal limit for intoxication began to be implemented across the country, deaths caused by drivers under the influence have been nearly cut in half. The passage of these much harsher drunk driving laws coincided with a nationwide publicity push about the tragic costs of drunk driving by advocacy group Mothers Against Drunk Driving, as well as the Ad Council’s iconic “Friends Don’t Let Friends Drive Drunk” commercials, which were run in all fifty states. Attitudes toward drunk driving have also shifted over time, with fewer people than ever before viewing drinking as socially acceptable behavior. Although cellphone use has only risen to widespread prominence in the past two decades, there is already a wealth of evidence that banning the use of hand-held mobile devices by drivers can have long-lasting positive effects on driver behavior and drastically reduce traffic fatalities. After bans on talking on hand-held cellphones while driving went into effect in the early 2000s in Connecticut, the District of Columbia, and New York, one study by the Insurance Institute for Highway Safety estimated that driver use of hand-held phones in these states decreased by as much as 6 percent within seven years after the implementation of a ban. Because bans on texting and driving are relatively new, reliable large-scale studies about their effect have not yet been conducted. However, recent smaller-scale studies have come to very promising conclusions. In states with laws specifically aimed at texting while driving, these laws have been associated with a 3 percent overall reduction in traffic accident fatalities. Researchers believe that these bans can prevent an average of 19 deaths in a state annually. Texting bans are also associated with a 7 percent reduction in car accident-related hospitalizations, with an even greater reduction in hospitalizations of individuals ages 22 to 64. Overall, a texting ban can translate into the yearly prevention of 30 or more motor vehicle-related hospitalizations in a state. Texting and driving laws are still in their infancy, but clearly have the potential to continue to reduce serious and fatal accidents caused by texting over time. There are now two bills before the Texas state legislature that would criminalize texting while driving. Senate Bill 31, introduced by Sen. Judith Zaffirini, D-Laredo, and House Bill 62, introduced by Rep. Tom Craddick, R-Midland, would make using a cellphone while driving a misdemeanor offense with only a limited exception for emergency use. A first-time violation would be punishable by a fine of up to $99, and repeat offenders would be subject to a $200 fine. The state legislature should move quickly to pass one of these bills and put it before Governor Greg Abbott for his signature. Our state lawmakers have an opportunity to reduce dangerous behavior, influence personal perceptions about the dangers of texting while driving, and help Texas join 46 other states in being on the right side of history when it comes to the scourge of distracted driving. Powerful public awareness initiatives about the dangers of distracted driving are already in place, like the Texas Department of Transportation’s “Talk. Text. Crash.” and the NHTSA’s “U Drive. U Text. U Pay” campaigns. Some of the nation’s largest mobile carriers have also joined in the fight against distracted driving: T-Mobile launched a service to block texting and driving, and AT&T is spearheading the “It Can Wait” campaign, which encourages drivers to take a public pledge to never use a phone while driving. All Texans should be optimistic that a statewide texting ban, coupled with continued widespread awareness of the serious consequences of texting from behind the wheel, will lead to the types of drastic improvements in public safety that were made after seatbelt laws and stricter DUI laws went into effect. See “Researchers: Texting and driving bans reduce crash-related hospitalizations,” Kim Krisberg, Science Blogs (April 10, 2015) (discussing study in American Journal of Public Health), available at http://scienceblogs.com/thepumphandle/2015/04/10/researchers-texting-and-driving-bans-reduce-crash-related-hospitalizations/.